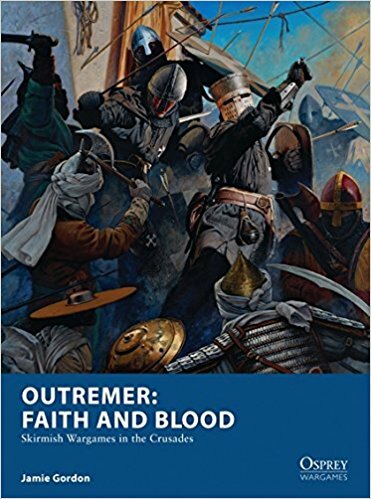 Outremer: Faith and Blood: Warming Weekend and Vaunted Return!! I'm also really interested to see what you've all been up to with the game! As such please stick a message below if you've been playing recently and if possible a link to your own blog, battle report or picture hosting site so that I can have a look and get some inspiration for my own wargames needs. If anyone is based in the UK and around London in the Summer then I'd love to have a game!! Let me know how you're all getting on! Good to have you back! That's an amazing paintjob, I love it. Now I really should start my own project! I got the minis, but still need some proper scenery. But really want to!! How about this for starters, but TBH all you need to do those is just some foamcore or a thick cardstock, glue up some rectangulars or squares. Dab the walls with some filler (or as some call it drywall compound) and all of a sudden you got an arab adobe settlement ready for some Outremer action. Best of luck! Cheers mate; it’s good to be back! I’m really pleased with the paint job, especially the Non-Metallic Metal on the Gold Crosses. To be fair you don’t need a whole lot of scenery (though it helps) ... there were plenty of skirmishes in the open desert scrub between townships and cities. Looks great! I lost the impetus on my own Outremer project when my co-conspirator apparently dropped of the face of the Earth 😱 I'm glad you're still getting to work on it. Cheers. I quite liked paintig the blue so I might do a full army of chaps like this. As the Knights of Jerusalem were a Military order of sorts, albeit non-monastic in nature I’ll probably run them using Military Order rules; I might adapt the rules slightly to reflect their unique status. How goes your hobby based activities? It's really good to hear form you again. I just recently picked up your book again and after giving it another read me and my fellow gamer buddy decided that we want to dive into this game, mainly because its marvelous campaign aspect. So he went with Templars (by Fireforge)and I chose Islamic side. Now due to lack of good arab miniatures (and by good I mean figures that can be easily magnetized with a lot of different weapon options) I went with the mongols also by Fireforge. Now it may seem lame to many, but the modular nature of the box is just a killer here, plus when you close one eye those can really pass as an weird arabic mountain tribe of sort...Hopefully we will be able to post some pic or a video material in a future of our gameplay. Hope the game doesn't "die", but will grow stronger, and while we are at it: do you have maybe any plans for other fractions...like say... Vikings (can't go wrong with those vagabonds in any historical period really, and there aren't really good rules for them in a skirmish scale games - SAGA is not a skirmish game no matter what others say) or maybe ...Mongols? :-) Anyways best of luck to you and all who visits this site! Hi Damian! I’m glad you’re back on it! I personally love Fireforge’s stuff, the models are beautiful and probably the best out there for modularity! Most of the Templars that I painted for the book are Fireforge! I’m definitely looking at a few expansions/variations (when I get time from the day job)... and everyone does love a Viking! That's great news! I do hope to see some Baltic area action:-) (I'm Polish so those Teutonic knights are up for some serious beating:-) or maybe not - after all that' s the beauty of this hobby. Anyways do you happen to know where did all those great buildings, that were used in the book, come from? I mean the facture on those buildings is just astonishing. I would like to get my hands on a couple of those myself for sure. Best of luck to you, and your plans concerning the game'n all! Well I’m looking to see what everybody wants... so can you post details of what factions you would like to see and what units you really think make up the core of the force. The buildings are from two companies Adrian’s Wall and Tablescape! Both are excellent and they really complement each other!! Also if you’re not on there already then join the Facebook Group! Well, as I've already pointed that out, to complete the middle east scene of that era I would really like to see some Mongols, as historically they did have the impact on the said area. As army features goes I think it goes without saying that it should be something tightly related to the "horsey" nature of the Mongols army a.k.a. no die drop when shooting from the horse back, also access to compound bows. On the other hand I really don't think that steppe warriors were after the heavy armoring kinda of warfare, so maybe no access to heavy armor or limited access to it (like 2 per warband)...Now as much as I would like to see some Baltic people in the game I really can't point out any of the distinguishing points of the armies for this region (at least not @ this time - but I will look into it). We finally got around to playing a couple of games and really enjoyed them. This game is extremely bloody with my Saracens being tabled in the first game (mind you we kept playing when I should have run, just for more practice with the rules). The second game was almost completely the reverse with my opponent's Crusaders getting kicked back. We both had a lot of fun and will be bringing others into the war as they finish their warbands. There is a post on the Facebook page with pictures: https://www.facebook.com/groups/162855534382686. Cecil! Great game and lovely pictures! What buildings did you use!? I find early on Islamic armies need to keep their distance and take down enemies at range. Also it sometimes pays to run away.... errrrr tactically withdraw I mean! I’ve joined the Facebook group under a pseudonym so I’ll see you over there!! The buildings are from the Plastcraft Saga range. They are really easy to put together, strong once assembled and scale well to the figures.